"The Earth is like a living being, it has its own soul; without the native soil and close contact with the Mother Country one cannot identify oneself, one's own soul"
These words of Martiros Sarian are substantiated in his unconventional art. Throughout his long, fruitful life he sublimated his boundless love for his fatherland, his consecration to the exalted ideals of serving the people. M. Sarian witnessed his glory. Very few are fated the luck of attending the inauguration ceremony of their museum and receiving its first guests. Martiros Sarian lived in the museum-mansion which the government of Armenia had built for him. The museum opened on November 26, 1967. The spacious halls of the three-storey building exhibit those hangings which the artist never parted with in his lifetime. Naturally the collection is far from being complete, most of the artistic works gracing the museums of Moscow, Leningrad, Tbilisi, Kiev, Rostov on-the-Don and many other cities. The collection of the museum comprises 160 canvases which the artist executed in different periods of his life. Many of them have earned him world renown. Mainly his early works are placed on view here: "Tales and Dreams" (1904—1907), "At the Well. A Hot Day" (1908), Self-Portrait" (1909), "Istanbul Dogs" (1910), apart from dozens of canvases painted in the Soviet period: "Aragats" (1925), "A Yard in Yerevan" (1929), "Three Ages" (1943), "Picking Cotton in the Valley of Ararat" (1949) and others symbolizing the revival of the Armenian people. He has an attractive gallery of portraits of conspicuous personalities of the Soviet Union and Armenia: Alexey Tolstoy, Ilya Ehrenburg, I. S. Issakov, G. Ulanova, Avetik Issahakian, Victor Ambatsumian and others. 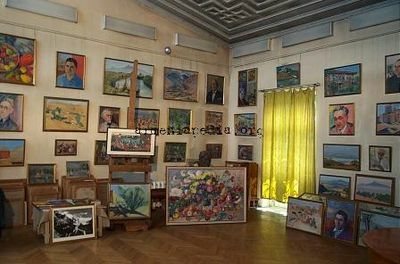 A special hall is assigned to the exhibition of the graphic art of M. Sarian. The museum houses also the artist's atelier where he created from 1932 to 1972. Here upwards of two thousand graphic works and water colors are stocked, in addition to 400 paintings which allow the periodical renovation of the exposition. Everything in the atelier is kept in its original form— the palette and the brushes of the past master. The viewers can familiarize themselves with the catalogues of shows of different years and the canvases executed by the artist in his last years. Every year the museum marks February 28 (M. Sarian's birthday) by a new exposition. Moreover, topical and red-letter day shows are often staged in the memorial-house. In the fourteen years following its foundation the museum has been supplemented with fresh acquisitions and donations: 'Mountain Scape" (1911), "The Guegham Range" (1926), "To the Spring" (1926), the portrait of "Victoria Halabian" (1931) and others. "...Thanks to Martiros Sarian we are suffused with the light of Armenia... It is the light that has in the long run imprinted happiness on the fruit, on the mountains, and on the faces." "It is a re-discovered treasure-trove. That color is so beautiful that the ages will secure Sarian, along with our Matisse and Cezanne, a top-ranking place. Sarian's position might even be higher, for he is the artist of happiness", wrote Louis Aragon. The still-lifes, different landscapes of Armenia and the portraits are amazing for their colors and light. Martiros Sarian's pieces of art have combined into one the traditions of the past and the present. He consecrated all his life to his socialist fatherland, to the happy Armenian people building a bright future. "People discern some likeness between me and Matisse. Maybe this is so, but there was no need for me to learn from him. To me the source of color and light has been Armenia", said Martiros Sarian. The M. Sarian museum arranges recurrently traveling exhibitions, and the hangings of the past master are exposed to view both in our country and abroad. Booklets, brochures and albums in numbers have been published; they popularize the pieces of art produced by Martiros Sarian, Lenin Prize laureate, people's artist of the USSR and Hero of Socialist Labor. This page was last edited on 30 November 2006, at 17:37.